Remember the movie "It." Think about how funny it will be to introduce a whole new generation of kids to Pennywise the clown. Let me tell you, my nieces really found it funny when I put on this Clown Neoprene Face Mask and hid the in the storm drain. Yes, they was laughing hysterically when I grabbed their feet as they walked by. They said, "is that you Uncle Mike, in that clown neoprene biker mask?" It was tons of fun and well worth the $10. 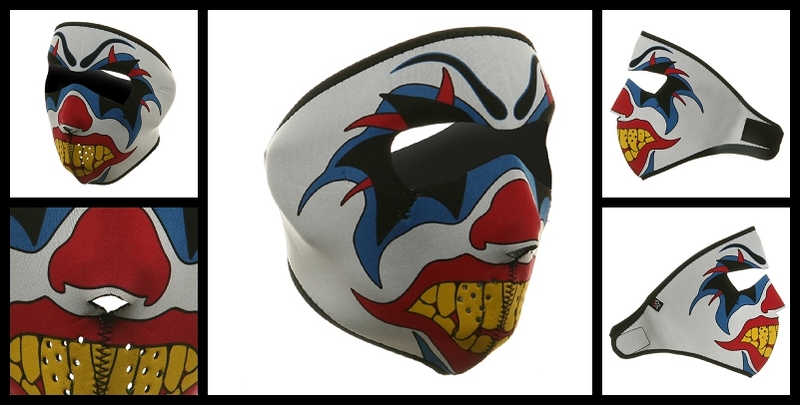 The best part is that this Clown Neoprene facemask is waterproof and helps keep you warm. That was very important as I wanted 4 hours for them to walk by the drain. Motorcycle face mask features full coverage of the face and ears. Stretchy neoprene material is warm and water resistant. Clown patterns are reversible to solid black material. Velcro closure ensures great fit with goggles, with a helmet or without. One size fits most.